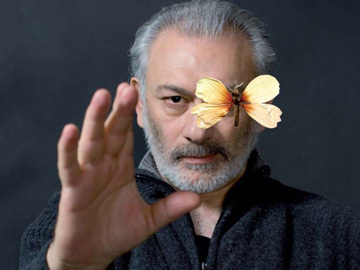 French actor and director Serge Avedikian is one of the first artists from the Armenian Diaspora to advocate the necessity of talking with Turks. He has observed that, today, the process of dialogue is stagnant, and the various initiatives have had mitigated results. In order to move ahead, the director is counting on a renewed expression from a new generation of Turkish intellectuals and artists. How did you meet Hrant Dink? Our first meeting took place in the Agos offices. When I was passing through Istanbul, in 1998, on my way to the Bodrum Festival, a first article about me had appeared in Agos. However, Hrant was not in town so we missed each other. When I came back in 2003 for the Bursa Festival and to scout locations for Nous avons bu la même eau (We Drank the Same Water, 2008), I was asked for an interview. I recall his first words very vividly. Standing up and embracing me, he said to me in Armenian: “You had become a myth for me, but here you are, for real.” Of course, it shook me a little and I wondered: “What does he think of me to say that?” I had an interview with him about the Bursa Festival and, in particular, about rediscovering, for the second time in 13 years, the village of Sölöz [editor’s note: the village of Serge Avedikian’s grandfather, near Bursa, where he shot his documentary film, “We Drank the Same Water”.] He was very surprised, which surprised me too, because although he was knowledgeable about the Armenian community and its history, he hadn’t heard of Sölöz. It means there are many stories, some close to Istanbul, that even Armenians don’t know about – which is understandable, since all this was hidden. And he went on: “It’s incredible, the story of that village. You’ve got to tell me more about it.” We remained connected. I met him before going to film in Sölöz, then after shooting, and when the film was edited. Once we went to the restaurant with Hrant, Cengiz Aktar, Ali Bayramoglu and Taner Akçam, who was passing through Istanbul. He introduced them to me. So, you got to meet these Istanbul intellectuals through Hrant Dink? That’s right. Because, in Istanbul, apart from a few people of Armenian ancestry, I didn’t know many people in the film or intellectual circles. Hrant is the one who introduced me to these people who surrounded him over a dinner at Boncuk’s, on the upper floor of the restaurant, as is customary. And you watched one of the first versions of “Nous avons bu la même eau” with Hrant, in Istanbul, didn’t you? Yes, it was six months before his death. I had come to the Short films festival in Istanbul. Meanwhile we had edited a first version of the film. Valérie Terranova, one of Jacques Chirac’s advisors, was visiting and asked me to introduce her to Hrant. Since I also wanted to show him my first edited version of the film, we held that screening which enabled to do both things at once. It was very moving. And this bond is very special since it was Valérie Terranova who called me with the news of Hrant’s death. Hrant had said: “This is the film that should be shown to the Diaspora. It shows that you have to go to Turkey to talk to people”. We were totally in synch with Hrant on the need to show an open mind and an ability to reach out to today’s Turkey, across the political board with the exception of fascists, to talk to people, and tell them we existed; and also, on the need to share our own discovery of the progress that was being made concerning Turkey within the Diaspora. It’s exactly what Hrant was working on with Agos, with his articles on Anatolian villages, on Armenian authors, on life before the Genocide, and also on Turkey’s ignorance of all this after the Genocide. We Drank the Same Water was doing the same work – i.e. to go and meet Turkish citizens who were unaware, at least in part, of the history of a particular village. Indeed, it was symbolically powerful that the space where Armenians used to live should now be occupied by Pomaks, telling what they felt as immigrants themselves in this story of a people substituted to another, and commenting on what Armenians had built and the traces they had left. It was one of the strong points which allowed a different dialogue to develop. I believe that Hrant was not only supportive of this approach but was, in his way and with his own team, fully involved in this type of work. There has been a genuine encounter between Hrant’s work at Agos and our own. It was a time when most Armenians from the Diaspora never contemplated coming to Turkey or even talking to Turks. In any case, those who did would do it on the sly. For instance, they came to look for memorabilia. In Sölöz, we learnt that some Armenians had come to collect an object or a tombstone. But this was done covertly because it was unmentionable. I think that our approach managed to break that taboo. When there was no recognition of his history, how could an Armenian talk with Turks, in Turkey itself, right where deportations and the genocide had taken place? This taboo was toppled by the film and by Hrant’s work. There have been many criticisms of the film because of that. A segment of the French Diaspora was very sceptical and said: “You’re just being taken in, you can’t have a dialogue with people who don’t admit to anything.” I think that it was a transition period for many, particularly for the young. It appeared that, after this film and several other projects, Armenians from the Diaspora started to go to Turkey. In a way, you opened the way. What did that process change, both with Armenians and Turks? First of all, people started to really talk, to ask true questions. How to get out of the deadlock of non-dialogue? How to get out of taboos on either side? In fact, both parties are cornered by their extremes. On the Turkish side, from the government and nationalists, you hear: “How can you talk with Armenians who force you to recognize a genocide that doesn’t exist?” And on the Armenian side: “How can you talk to people who don’t even admit that it was genocide? It’s like talking to a brick wall.” I think it is this stumbling block that was forced through, but not for everyone. To my mind, the result is quite mitigated. We shouldn’t forget that when collecting signatures for the Forgiveness plea launched by Turkish intellectuals – which also toppled some taboos – the result didn’t turn out to be as good as the organizers expected. They imagined – or at least hoped for – that they would get a tsunami of signatures, and so did I. It could have empowered those who had previously remained silent to speak out democratically. They thought that they would get a million signatures. I believe that there finally were no more than 30,000, which wasn’t so bad, but still way down what was hoped for. I’d say that the process opened up a breach, which enabled many young Armenians to travel to Anatolia. A few had done it before, but now it was in the open. Connections were initiated and debates organized, particularly in France, with Turkish intellectuals such as Ali Bayramoglu, Cengiz Aktar, Ahmet Insel and Taner Akçam. I attended most of them. There were also books published featuring dialogues between Armenians and Turks. I feel that this initial ebullience has somewhat abated because more far-reaching and long-standing initiatives are now building in its wake. And films too, I’m sure of that. When you unwittingly are a pioneer, you keep your finger on the pulse of things and can see them coming. It may not happen right away. There are lulls, and returns to scepticism. Let’s not forget that Hrant’s death happened, with double-edged results. When these initiatives started to multiply, Hrant became dangerous in Turkey. Why is that, do you think? What was he changing in Turkey? I think that it was the audacity of his speaking frankly. As long as an intellectual remains intellectually demonstrative, he isn’t dangerous. He only becomes so when he stops being intellectual, when he wages a real battle with deeply felt words, with words that everybody can hear and that can be heard by many. I think it’s at this stage that the authorities saw that man as a threat. He took up too much space and, above all, with his charisma, he enthralled Turkish intellectuals. Instead of confronting him, they followed him. To me, it’s what is so painful in this murder because, again, it’s an Armenian who was killed, and not a Turkish opponent. It changed many things and angered most of those who were listening to him. Hundreds of thousands of people took to the streets for his funeral. Did you expect such a response in Turkey? No. I thought that it would be a solemn time, and recaptured by the government, which was partly the case, but I never thought there would be so many people down in the street. No-one had anticipated such an outcry coming from crowds holding protest signs. This demonstration will never be forgotten, it even is perpetuated to a certain extent upon each anniversary. It became a sort of symbol. On the other hand, Hrank is gone. There’s no leader anymore. It caused the movement to atomize. Everyone remains in his corner, disorganized. There is the Foundation, there are initiatives, and all this quite positive, but still it’s a beheaded battlefront. Certainly. At the head of a protest movement, asking for a wider democracy, for certain things to be recognized in Turkey, you shouldn’t have an Armenian. Hrant was a Turkish citizen, granted, but the leader should be a citizen who cannot be blamed for being “Armenian sperm” or Kurdish. That’s also what is difficult in Turkey because you’re immediately accused, old time reflexes and exclusions spring up again, so if it’s a Turk, at least it will be less acute. It will also have another meaning. Yes. It will show the maturing of the Turkish civil society, which dares unveil itself. It definitely exists among journalists, intellectuals and artists. I’m convinced of that. Osman Kavala makes things happen in his own way, as a cultural entrepreneur – huge and unbelievable things. And he’ll go on doing it. But others are needed. Six years later, how do you view the general and political situation in Turkey? Has public awareness concerning these issues progressed? I think we don’t have enough perspective on this yet. But there are halts, times for maturing, understanding and digesting. I also think that we’re currently living the time it takes to prepare a response. Which forms will it take? I know a few, but not all of them. Artists will express themselves in the coming months. There is a new generation of intellectuals, younger, more mature, who are not university professors, journalists or stars, and who have freer hands. Because I have reached a certain age, I know what it means to put one’s fame at stake, to fear losing one’s place. There is self-censorship. You need people who are not into self-censorship because they have nothing to lose. That’s why I’m implementing a new project to let very young filmmakers from very different countries talk, for instance, about the idea of Diaspora. At some point, you were quite critical of the fact that the dialogue in Turkey was not moving ahead. What do you think of it today? It’s easy to criticize or note what is. But you must above all try and understand the reasons, particularly the underlying reasons. When great things are born, it takes some time before they are assimilated and a new language is found. To eternally repeat themselves it tiring to people and doesn’t bring them much. This is why I mentioned new generations. Those who express themselves at the moment are over 50. They have lived through pivotal, politically crucial eras – of opening, of murder, and other events. But today, the new generation views this in its own way. Naturally, older intellectuals should keep on expressing themselves, but I think that their real role (and the role I give myself too) it to pass on the torch. It’s to encourage the young – i.e. those between 25 and 35, with a real conscience and who study the situation, to reach a new way of voicing change. Intellectuals should stop taking up all the space. We never stop repeating the same things. Discovery comes from fresh, innocent wording. The current stalemate should lead to more reflection. People should be encouraged to write and speak up on deeper issues. On the eve of 2015, which trend will carry more weight: that of thousands of people remembering Hrant Dink six years later, or demonstrations brandishing placards that read: “You’re all Armenians, you’re all bastards”? What is your feeling? I feel that it will be an important time. But I’m worried that it might be a façade battle and that in-depth thinking will be lost. Turning a cause into slogans can also reveal things to people who don’t hear anything else. But the battle will probably get interesting when young Turkish directors from Turkey or Germany reveal their feature or documentary films to the face of the world. It’s their expression that will make a difference, not that of Armenians. It’s the voice of Turkey in the global sense of the term – that is of Turks living here and there – who will reveal their position in relation to this story in a more powerful way than usual. It may be through painting, filmmaking, literature, through a political or philosophical work, or some form of political public speaking. There are many projects throughout Armenia and the Diaspora, but it’s not what will be interesting. What would be unexpected is a film by a renowned young film director or the book of a young writer – in both cases someone living in Istanbul. That’s what would make a difference. And maybe also events in Turkey that would be slightly different than those on 24th April, with clear positioning, with colloquiums – although let’s not forget that there were some already, but they should have more visibility, involve the larger public. One of Hrant’s dreams was to see Armenian and Turkish artists sing together on the same stage. Will that dream come true if we get to see Anush, the opera you’re working on in Istanbul? It will be one of the elements. Anush is a dream project to show certain things. It was written originally by an Armenian as a poem, and taken up by an Armenian composer living between Yerevan, Tbilisi, Gyumri (Alexandropol) and Istanbul, and it has already been performed in Turkish. I haven’t located the Turkish text yet, but we’ll certainly manage to do so. It’s a dream project to say: this show happened before the Genocide, it happened after the Genocide, and it is happening now, in a more open way, for everyone to see. Because a guy who doesn’t live either in Yerevan or Istanbul anymore, but in Paris, decided to revive and dust off a popular work, which speaks to absolutely everyone. It speaks to Turkey as well as to Armenia. The opera Anush tells stories of honour crimes which could happen in Anatolia or the Caucasus, and takes place in unnamed mountains. I deeply wish that in 2014, Anush comes to Istanbul and other cities, such as Diyarbakir. It will also speak to Kurds. The opera will be staged at the end of April in Yerevan. I do hope that it can be programmed afterwards in Istanbul and elsewhere. Istanbul is now part of nearly all your projects. Absolutely. The film on Parajanov is almost ready and we’ll be in Istanbul next spring or autumn for festivals. Parajanov will also be heard of in Istanbul. He is someone who made a film in Armenian about a Georgian-Azeri man during the Azerbaijani-Armenian Nagorno-Karabakh war. Artists must be cross-boundary, they must transcend divisions. It doesn’t mean that the problem doesn’t exist, but these works point to the problems. The film on Parajanov will also be political, even if it is expressed through art, through cinema and collage. The Anush opera will also be political in its own way. As for The Last Round in Istanbul, I hope we’ll be ready in 2015. So 2013, 2014, and 2015 will bring three large projects towards Istanbul. Anyway, it’s one of my places of spiritual birth. My grandfather was born a few kilometres from Istanbul and it’s through the port of Istanbul that his ship left back to Armenia, and through Istanbul again that we came back. Istanbul lies at the centre.